Rome The Byzantine Empire - HISTORY'S HISTORIESYou are history. We are the future. Geography: How do people interact with their environment? Realizing that the Roman Empire had become too large to be ruled by just one man, in 285 CE Emperor Diocletian split the empire into a western and an eastern half. After the split, Diocletian declared that the empire was to be ruled by four men. Never very fond of Rome, Diocletian decided to rule from the eastern half of the empire. He appointed his son-in-law to be one of the rulers in the west. Instead of resulting in a more effective government, however, the division of territories almost immediately resulted in a power struggle between the different rulers. After years of struggle, Constantine, the son of one of the original four rulers appointed by Diocletian, took sole control of the empire in 325 CE. As Emperor, Constantine reunited the Roman Empire under his rule and in 330 CE he built a new capital in Byzantium, a city of strategic importance located in present day Turkey. Not long after, he changed the name of the city to Constantinople, or "City of Constantine" in Greek. Today, we know Constantine's city as Istanbul. Today's Istanbul blends the cultures of the east and the west, as well as the ancient and the modern, making it a city like no other. Geographically, Constantinople/ Istanbul is in a very interesting position in the world. The landmass that is Turkey, and that was the the center of the Byzantine Empire, acts as a kind of land bridge that links the continents of Europe and Asia. In the fourth century, it was a crossroads of cultures. Even though Constantine united the Roman Empire and moved the new capital from Rome to Constantinople, the Empire was really two separate kingdoms. Different ideas about religion and a different blend of cultures emerged in each half of the Empire. As a result, the eastern half of the Roman Empire was very different from the western half. When the western half of the Roman Empire fell into the hands of the Germanic tribal leader, Odoacer, in 476 CE, the eastern half remained intact. The eastern half of the ancient Roman Empire became the Byzantine Empire. ​What advantages made Constantinople and ideal place for a capital city? Known as the Byzantine Empire, the Eastern Roman Empire was most powerful in the 500s CE. At that time, the empire stretched east to Arabia, south to Egypt, and west to Italy. Constantinople was the capital of the empire. The location of the city gave it special advantages. The city sat on a peninsula between the Black Sea and the Aegean Sea. It was surrounded on three sides by water. This made the city easy to defend. Because the city sat between Europe and Asia, it became a crossroads for trade. Merchants from far away did business there and trade grew. From the mid-5th century to the early 13th century, Constantinople was the largest and wealthiest city in Europe. What led the Byzantine Empire to become one of the most advanced civilizations in the world? Fishing boats, trading ships, and warships could use its harbors. The seas around it made it easy to defend. Two major trade routes crossed through it, so traders from Asia to Europe sold goods there. People called Constantinople the “New Rome.” Many wealthy Romans moved there. The city had many Roman-style buildings, including an outdoor arena for sporting events. It was called the Hippodrome, and it was where chariot races were held. Just as officials did in Rome, officials in Constantinople gave free food and entertainment to the poor. Drawn by the promise of a better life, people from many lands settled in the Byzantine Empire. Being at the crossroads of different cultures meant that the Byzantine Empire was also something more than Roman. Different cultures blended together to form a new culture. Today, we refer to that culture as Greco-Roman. Greco-Roman culture is a blending of traditions that are both ancient Greek and Roman. For example, the Byzantines enjoyed public baths, swimming pools, and chariot racing, much as the ancient Romans did, and Latin was the official language of the government. However, most Byzantines spoke Greek, so Greek was the language of everyday use. Because of that, even emperors learned Greek. Over time, the Empire became less Roman and more Greek. That rich blending of cultures led the Byzantines to develop one of the most advanced civilizations in the world between 500 and 1200 CE. ​Why was Empress Theodora so important to Justinian's rule? Justinian became emperor of the Byzantine Empire in 527 CE. He ruled the Byzantine Empire when it was at its most powerful. He was a skilled general and a strong leader. He controlled the military and made the laws. Justinian was married to Empress Theodora. She helped Justinian rule the empire. Theodora helped her husband choose government officials. She helped women gain more legal rights. She urged Justinian to grant women the right to own land. This reform helped widowed women earn money to take care of their children. Brain Box: What made the role of Empress Theodora so unique for the early middle ages? After angry taxpayers rebelled in 532 CE, Empress Theodora's wisdom helped stop the crisis. When the people threatened the government by rioting, Justinian's advisers told him he should leave the city to be safe. Theodora, however, told him that he would not like his life if he ran away. She said he should stay and fight to protect the Empire. He took her advice and stayed. Justinian's army stopped the riot and brought order back to the capital. This victory made him an even more powerful ruler. What was the goal of the Justinian code? ​One of the most important things Justinian did was in the area of law. As Emperor, Justinian established what has come to be called the Justinian Code. The Justinian Code consisted of the laws and legal decisions of the Romans as far back as the time of Emperor Hadrian in 117 CE. Justinian asked scholars to organize the ancient laws and to simplify them and make them better. It was the first time that anyone had attempted to do that. The new laws were easier for people to understand and follow. Emperor Justinian also added new laws to the code and had scholars provide guidelines for judges and for students of law. The Justinian Code was not only important in the time of Justinian, but also important to civilizations and cultures that would come after. The Justinian Code is still the basis of legal systems in many countries today and serves as the foundation of many of the world’s democratic legal systems. For example, the Justinian Code states that a man is innocent until proven guilty. Not everything in the Justinian Code was democratic, however. There were laws that discriminated against Jewish people and others who practiced a faith different from the official religion of the Byzantine Empire. Truly a work of art and a marvel of architectural engineering, the Hagia Sofia's enormous dome was unmatched in size for over 800 years. Mosaic showing Constantine, right, holding a model of his city and Justinian, left, with a model of the Hagia Sofia. What are three things that make the Hagia Sophia special? Many Byzantine emperors supported the work of artists and architects and ordered workers to build forts, government buildings, and churches all over the empire. 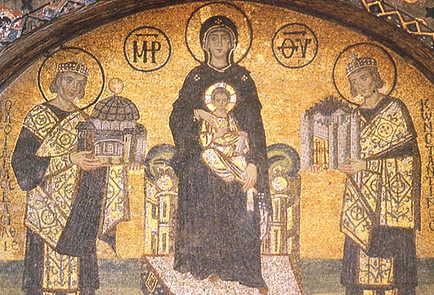 In 537 CE, Justinian ordered the building of a church called the Hagia Sophia, or "Holy Wisdom." Justinian had materials for the construction of the church sent from many parts of the world, including Egypt and Syria. Nearly 10,000 people helped to build the church. It was considered to be a masterpiece of architecture in its day, and it still stands as a marvel of engineering. It is so large that Notre Dame cathedral in Paris could fit in its nave. It is so tall that the Statue of Liberty could do jumping jacks without touching its enormous dome. The Hagia Sophia has gold and silver decoration inside. It is also decorated with mosaics, pictures or patterns made from small pieces of colored glass or stone. The Byzantines became famous for their mosaics. This Byzantine art usually showed figures of saints. Saints are Christian holy people. Over the centuries, the Hagia Sofia has served many roles. After serving as the religious centerpiece for Justinian's empire, it became key to the Eastern Orthodox church. During Ottoman rule, it was turned into an Islamic mosque. It still stands today as a museum and is visited by millions from around the globe. Why did Justinian build a strong army? Justinian knew the empire had once been much larger. He wanted his army to be strong so they could take back the lands that had once been part of the empire. He wanted his army to protect the borders of the empire. A general named Belisarius reorganized the Byzantine army and made it stronger. He created cavalry - groups of soldiers on horses. The cavalry wore armor and carried bows and long spears. Justinian’s army fought in Italy, Spain, and northern Africa. It conquered the invaders who had taken lands from the Western Roman Empire. The army also defeated the Persians. It was able to secure the eastern border again. However, these conquests did not last long. A deadly disease, known as "Justinian's Plague," moved through Asia and Europe. It killed millions of people, including Roman soldiers. There were not enough soldiers to protect the large empire. There also was not enough money to pay them. After Justinian died, the empire again lost control over most of the western lands. How was the Christian church different in the western and eastern parts of the Roman Empire? CLICK above to learn more about the architectural elements of a Byzantine church. Despite speaking mostly Greek, rather than Latin, the people who lived in the Eastern Roman Empire considered themselves Roman. Divisions in the Empire were more than geographical, however. In addition to having separate capitals - Rome in the west and Constantinople in the east - there was one other main difference between the eastern and western halves of the Roman Empire. That difference occurred within the Christian church. Christianity became the official religion of Rome in 380 CE, but the practice of Christianity developed differently in western and eastern parts of the Empire. In the eastern half, the Church leader was called the patriarch. The patriarch was appointed by the emperor. Therefore, it was really the emperor who was head of the church. In the western half, Christians believed that the pope was the head of the church. In the Byzantine Empire, the emperor had power over the church and the government. In the West - where after the fall of Rome in 476 CE, there was no longer an emperor - ​the pope eventually claimed authority over all the governments and churches in Europe. The differences between the two churches went on for centuries and were so serious that in 1054 CE their leaders excommunicated, or cast out, each other. This resulted in a schism, or separation, between the two churches that remains today. What event led to the final collapse of the Roman Empire? For centuries leading up to its end, the Byzantine Empire with its capital in Constantinople had been in decline and under threat from rising powers in the east. These powers were ruled by Sultans. In the middle of the 15th century, just as the veil of the middle ages was beginning to lift in Europe, Constantinople found itself entirely surrounded by an Ottoman Empire eager to expand its domain. The final blow came in the spring of 1453 when the Ottoman Turks, led by Sultan Mehmed II, laid siege to the city for fifty-seven days. On May 29, the Sultan led an over-whelming force that successfully breached the walls of the city and proceeded to massacre its citizens. 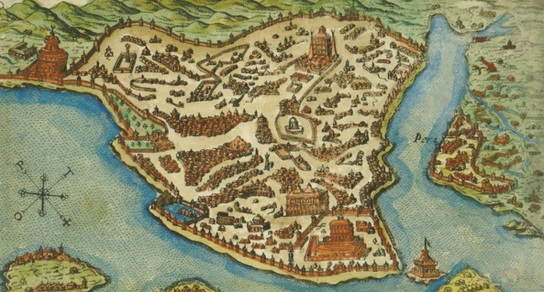 Following his victory, the Sultan moved the Ottoman capital to Constantinople. With that move, the ancient Roman Empire was no more.